Teena Olsen of Sacramento, Calif., shows how she made this side-moon marble nail art design. Teena Olsen (@tee_ohh) of Sacramento, Calif., shows how she made this side-moon marble nail art design. 1. Prep the nail for gel-polish application, apply base coat, and cure. 2. Apply another thin layer of base coat, allowing polish to drag easier. Use LeChat Perfect Match Beauty Bride-to-Be, Mi AMour, Utaupia, and Orly GelFX in Rage to place large dots of color around the perimeter of the nail, leaving one side open. Do not cure. 3. Use a fine art brush or a small dotting tool to drag the dots toward the center of the nail and cure. 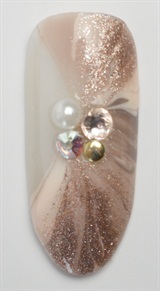 Apply a small amount of gel to the center of the nail and place the stones into the gel then cure. 4. Apply two coats of gel top coat to set the stones and cure each layer.